I've had the idea to try a PT2399 chorus ever since I modded my Clari into a Clari Cubed. The challenge with the PT2399 is to get the delay time as short as possible while still having some wiggle room for the LFO injected into pin 6. I've tried PNP, NPN, FET and LDR - fail! The delay time is either too short for the LFO to have any wiggle, or too long and latency is obvious. So, screw using pin 6, just ground the MF for the shortest possible delay time and instead modulate the vref at pin2. 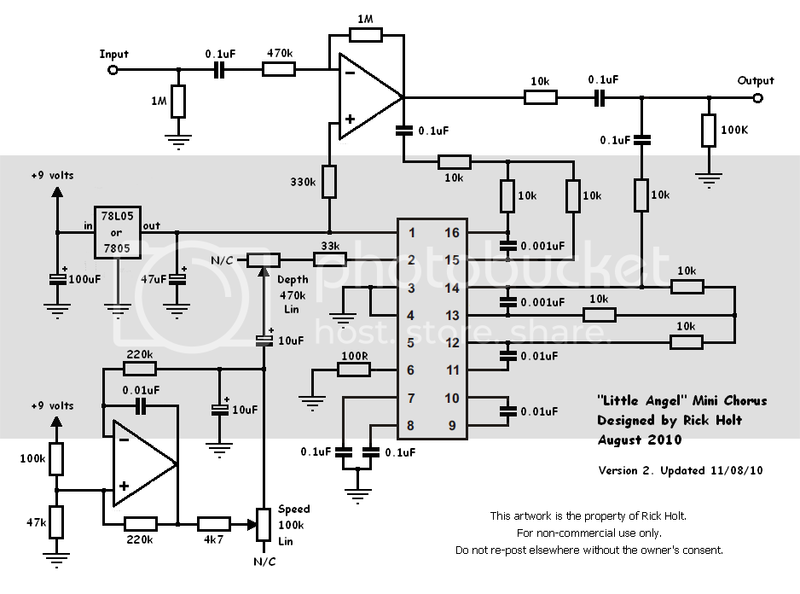 Shortest possible delay with as much LFO wiggle as you want. In fact it has to be tamed down or you're into tape wobble type effects. I'm still testing this for any failure modes, but so far it seems very stable. Some values may change a little as I fine tune it. TBH I haven't paid any real attention to the filtering caps and their values, as at the speeds this is running at there is no hiss anyway. Those familiar with the PT2399 family of delays will recognise homage to Rebote and the Clari in the input buffer and output section respectively. Just kidding. I love it! Great idea. I can't wait to hear clips. I dig the Vref approach! Interesting. I like the simplicity of the circuit. A board wouldn't even be necessary, unlike most other chorus schemes floating around out there. What opamps did you use? ...and instead modulate the vref at pin2. Wow, how did you came to this idea? That's cool! Do you have a technical question? Please don't send private messages, use the FORUM! I'M ONLY GETTING CLEAN OUTPUT!!!! Why did you put a Depth pot value of 470K? Why not put it at 500K? I dont know too many places where you can get a Linear 470K pot other than for a Wah. Also, igerup... what do you mean by a "A board wouldn't even be necessary." How would you build the circuit? I'm using a NE5532 dual opamp. I used a 470k because here in the UK that's what we use, 500k seemingly being a value available in the US but not here. 500k will work just fine. How did I come up with the the idea? Well, as I said, I've been trying PNP, NPN, FET and LDR methods into pin 6 but I just couldn't get the resistor value down low enough. So in sheer desperation I thought about actually modulating the +5v feed into pin 1, as I'd notice the delay time 'swoops' if you quickly turn power off and on again - I didn't try it but it got me thinking outside the box. Then I just figured WTF I'll just plug the LFO dirctly into the vref - wobble wobble wobble! There's few enough parts for this not so very complex circuit (lets face it, compared with some other projects on this board it really isn't. No offense meant to frequencycentral with this statement, though) that it can safely be built using the PTP (point-to-point) method. If you have the courage to do it is another matter alltogether. I suppose you guys want soundclips yeah? How does this one sound Rick ? I'm no EE or even a tech,just a monkey with a soldering iron that can read,and follow instructions. Nah, take it easy. I assume it sounds just like all other pt2399 chorusing I've heard. So, I wonder what the delay time of a PT2399 is with pin 6 grounded? I assume it sounds just like all other pt2399 chorusing I've heard. Make recording of some "pop" (e.g. switch some DC at input) and measure distance between original peak and delayed peak in this recording. T.
I thought it needed at least 100R or so to keep too much current from running out. You can check it of course if you play a short note/tick through it without modulation and then record that and measure the peaks. That actually sounds different then modulating pin 6. It has more of a vibe feel to it.. come to think of it.. how does it vibe without the clean mixed in? Sounds great! Is the sound at 0:11 (the first time the effect is used) at the slowest speed?